Soundings: September Issue – Eco Alianza de Loreto | Loreto, B.C.S. 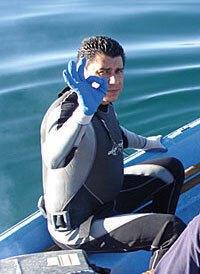 Divers conduct surveys of near-shore marine ecosystems. 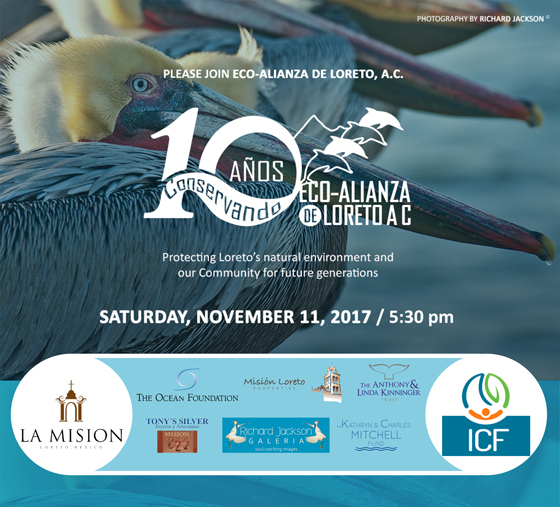 Eco-Alianza, UABCS, and Loreto’s Dolphin Dive Center all are joining hands to support an ecological monitoring program focused on the health of reefs and near-shore ecosystems in the Gulf of California. The program was initiated in 1998 and has already generated more than 40 published scientific studies. The multi-institutional program trains and uses citizen-scientists to monitor hundreds of species of marine life in dozens of conservation-critical locations throughout the Gulf of California. Leading institutions include the Scripps Institution of Oceanography at U.C. San Diego, University of California Institute for Mexico and the United States (UC Mexus), the Center for Marine Biodiversity and Conservation, and the Ezcurra Lab. Before the end of the year, and again next year at least, Eco-Alianza will provide space and logistical support for a one-week workshop supporting the monitoring program. The workshop will include three days of “classroom” learning followed by three days of underwater applied monitoring training. Citizens participating will monitor sea life throughout the year in specific locations. Divers interested in participating must pass certain medical criteria, have at least 30 dives, and meet other qualifications. For more information, contact Eco-Alianza’s Projects Director, Jimena Gallegos, at jimena.gallegos@ecoalianzaloreto.net . As the September issue of Soundings goes to “press,” more than 80% of the seats for Eco-Alianza’s 10th Anniversary Gala on November 11 are already sold. Space in our outdoor courtyard is strictly limited, so if you have not yet reserved your seats, please do so without delay. For this hallmark 10th Anniversary, demand and anticipation are unusually high, for good reason. We have some truly amazing items and experiences up for auction, a few surprises in store, and very likely some wonderful news to announce. This is definitely a “don’t miss” celebration for Eco-Alianza supporters. This event is being underwritten by the International Community Foundation and La Misión Loreto Hotel, which is also catering the dinner. 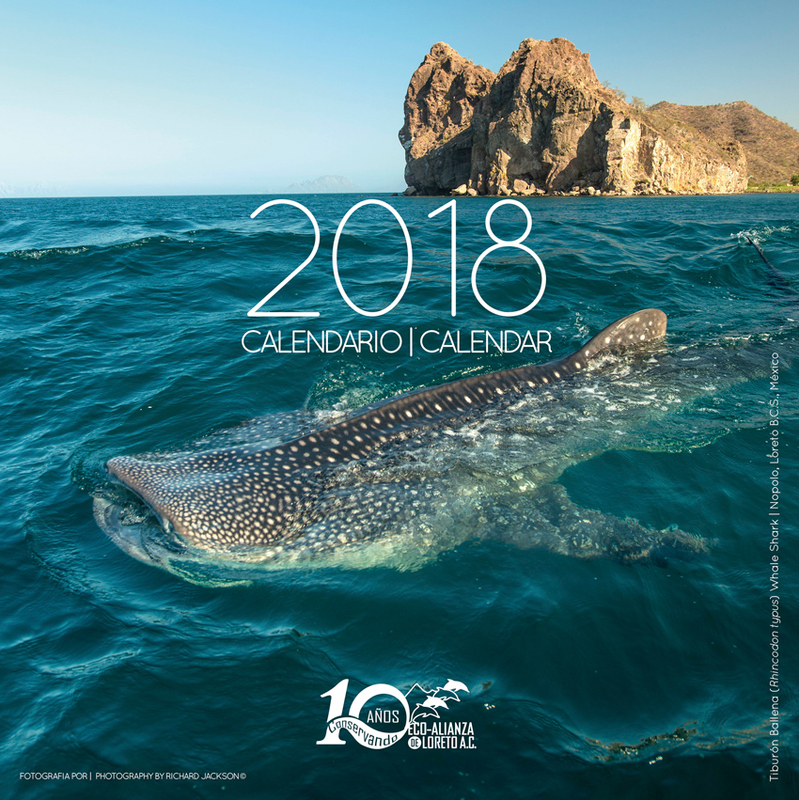 The Ocean Foundation is the wine sponsor, and additional event sponsors include Tony’s Silver, Misión Loreto Properties, Richard Jackson Photo Galería, Anthony and Linda Kinninger Trust, and the Kathryn and Charles Mitchell Fund. In other words, all event expenses are covered, so every cent you spend on the event will go directly to support Eco-Alianza’s environmental education and conservation programs. The silent auction, live auction, and raffle are supported generously by Eco-Alianza donors. It’s not too late to pitch in to this 10th Anniversary with a donation of an experience or item to be auctioned. Maybe a stay at a vacation home or time share? A piece of heirloom jewelry, a basket of goodies, a gift certificate? How about lessons in something at which you’re an expert, or a special outing? Please contact Edna Peralta before October 15 if you’d like to donate an item or experience (edna.peralta@ecoalianzaloreto.net). Lastly, if for some reason you can’t join us on November 11, we will surely miss you. Any supporting donations you’d care to make will go directly to environmental education and conservation programs, and “all donors in absentia” will be announced at beginning of the event. Simply pull up the reservation form, and fill in the box for “donation”. Thank you for your support! 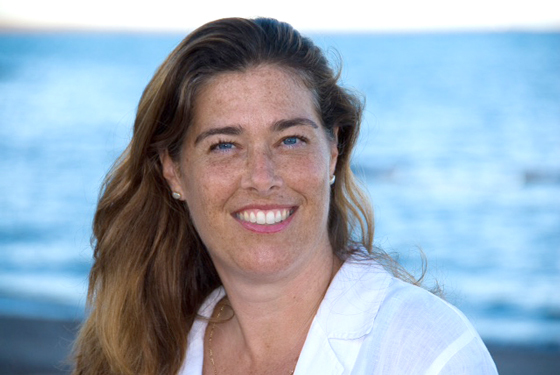 Loreto entrepreneur (and Eco-Alianza Board member) Jill Jackson will kick off a new “Startup Grind” presentation series at Eco-Alianza’s CenCoMA headquarters on Saturday, September 30 at 5:00. Please join us! The series will explore the entrepreneurial process and the key factors for sustainable business excellence. Through an informal “fireside chat” format (in air conditioned comfort), Jill Jackson will trace her pathway from an almost impulsive real estate purchase in 2004 to a thriving real estate and boutique hotel business today. Jill’s stories relate to nearly any entrepreneurial enterprise and to anyone familiar with Loreto. Her free presentation is mostly in English, but Q&A in English or Spanish. This year’s winners of the Javier Mercado Scholarship are Francisco Alberto Martínez Aguiar and Cesar Eduardo Yañez Valdez, who will be supporting environmental conservation projects in the municipality of Loreto. The scholarship, supported by the Anthony and Linda Kinninger Trust, is awarded annually by Eco-Alianza to provide financial support for a student in the Alternative Tourism Career track at Autonomous University of Baja California Sur, Loreto Campus (UABCS-Loreto). This year, two students of merit were chosen. The scholarship was instituted in 2009 in memory of businessman Javier Mercado León, who for three years served as Professor of Marketing on the campus. He was also one of the four founders of Eco-Alianza. Read more about Javier by clicking here. From 2010 to date, eight students from the alternative tourism career program of UABCS-Loreto have been supported by the scholarship. The first award was made to Nidia Isabel Ramírez Arce, who works at Eco-Alianza as an Environmental Program Coordinator. The scholarships are part of an ongoing and growing collaboration between Eco-Alianza and UABCS. 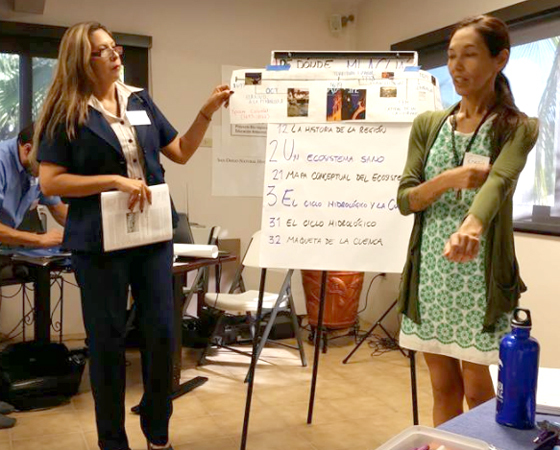 Representatives of the San Diego Natural History Museum’s PROBEA program convened a one-day workshop meeting at Eco-Alianza on August 28, including environmental educators, government officials, NGO representatives and museum professionals. The group collaboratively assessed the state of environmental education in the region, defined gaps and opportunities, and discussed strategies for better serving the regional community. According to organizers, the workshop sought to bring together stakeholders to define a regional environmental education strategy, while strengthening relationships within the environmental education community. About 20 participants attended, mostly from Loreto and Santa Rosalía. 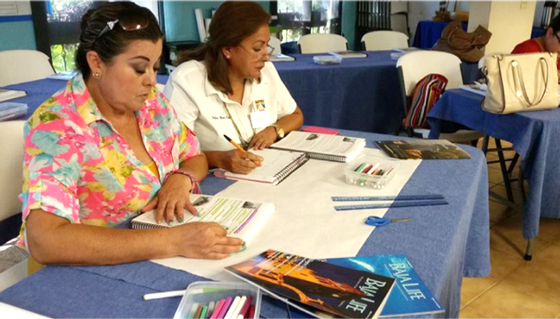 The workshop was one of four that the museum held throughout the Baja peninsula, as part of re-defining PROBEA’s work. 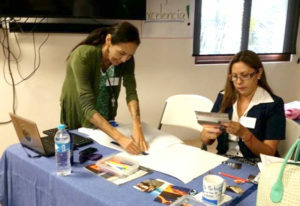 Although the nonprofit organizations and government departments differ in their operating procedures, in the objectives of their missions, and in the audiences they serve, organizers said, the meetings are valuable in sharing work experiences in the region. The variety of environmental education tactics used by each of the organizations provided a diversity of perspectives and a vision of the needs of the communities we serve. Working collaboratively with PROBEA (Proyecto Bio-regional de Educación Ambiental) over the last few years, Eco-Alianza educators have among other things presented a multi-level water conservation curriculum in Loreto schools, including children and scientists assessing and enacting water conservation opportunities at local school facilities. Blue-winged Teal pair (Anas discors). Cinnamon Teal Pair (Anas cyanoptera). On any day from late fall to late spring the freshwater pond on the Loreto Bay golf course can have over a hundred migratory water birds using it, including Ducks and Geese, Grebes, Coots, Gulls, Rails, Phalaropes, Shorebirds, and once, even a Tundra Swan. Many will spend their entire winter season there, safe on the water and feasting upon the abundant invertebrates and vegetation in and around the pond. Up to a week ago, and pretty much since the end of spring, there haven’t been any birds on that pond. 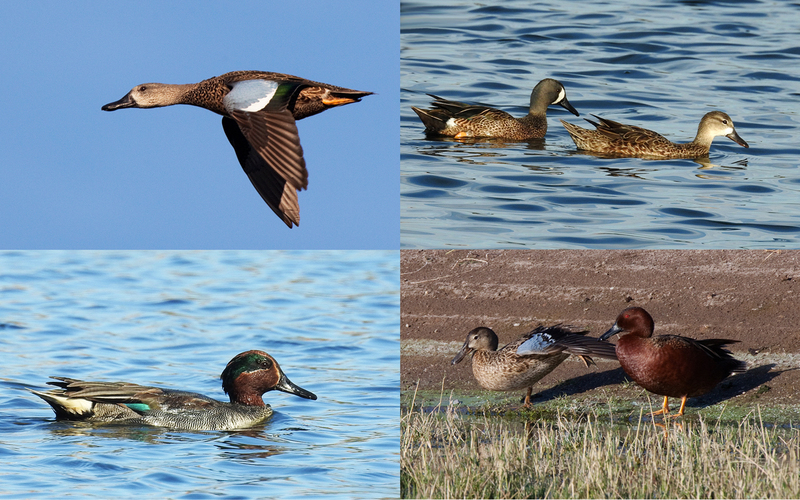 Today there are five Blue-winged Teal, and they will be joined over the coming months by their close kin, the Cinnamon Teal and Green-winged Teal. Teal are usually the first of the duck and goose families to arrive here, with Blue-wings the first of those. The Blue-wing Teal is also known as the Summer Duck, likely because of its tendency to show up very early in the migrating season. When they choose to migrate, they do so with dispatch. The tag from a Blue-winged Teal was recovered, 14 days after it was tagged in Canada, thousands of miles away near Santiago, Chile. Teal prefer small bodies of freshwater and can be seen on roadside ponds throughout the nearby countryside, especially in the mountains. They tend to stay in small flocks of fewer than a dozen birds and once settled on a pond are reluctant to leave it for long. If disturbed they will usually fly a short distance and land again, often just a little farther away on the same pond. Teal are among the most beautiful of waterfowl and well worth a bit of prowling around to get a closer look. On a trip up to San Javier, watch for them on the many small bodies of water alongside the highway.